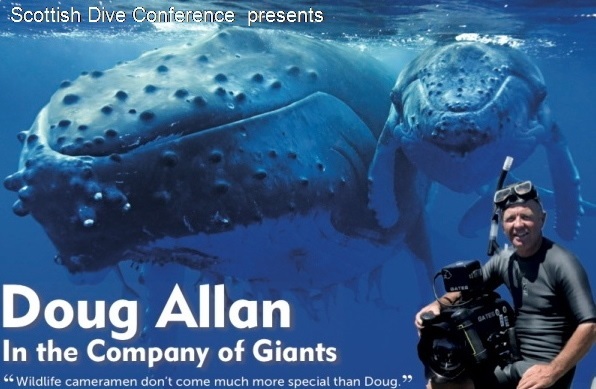 Scottish Dive Conference - 1 week to go! With just over a week left until the Scottish Dive Conference at Stirling University, tickets are selling out fast. Sales are limited due to the maximum capacity of the main lecture theatre, so if you still haven't bought your tickets yet make sure you act fast to avoid disappointment. You have until 6pm on Thursday 13th November to make your booking for what is all set to be an amazing event. You can buy your advance tickets from the website here. The full schedule of the day’s events will be available shortly. In the meantime, you can keep up to date with all future SDC related announcements through our "Scottish Dive Conference" Facebook page. to name but a few. So don't miss out! In addition, there will be plenty of trade stands with lots of dive kit for sale at excellent prices, plus each attendee will be given a goody pack containing a schedule, leaflets, pens, and slap strap. Tickets can be purchased on-line here. Tickets cost or £25 on the door, but pay only £20 when you buy in advance from our website. Tickets for the evening are £15, and can be bought on the door to the conference. From the East, South or West take the M9 to Junction 11. At the junction there is a roundabout which marks the end of the M9. From here you should take the exit for Bridge of Allan, follow the road through the town itself, and after about 200 metres you will find the University entrance on the left. From the North take the A9 to the same roundabout and follow the same route through Bridge of Allan as above. By Bus - see here and click on the Bus tab. There are two categories for the photo competition "Above the water" and "Below the water". To enter just print out your pictures and bring them along with you on the day. Voting will be made by those attending the conference, and winners will be announced that afternoon. 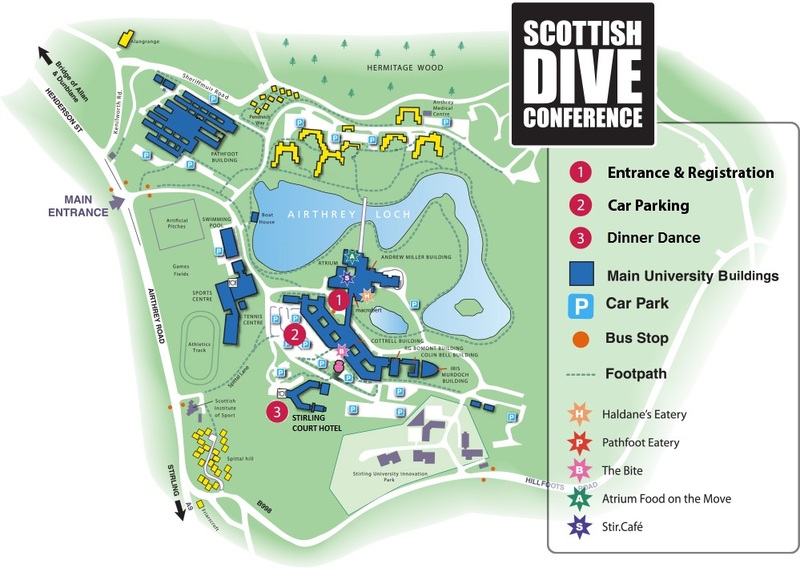 Scottish Dive Conference 2014 - Line Up Announced! Details of this year's Scottish Dive Conference have been released! The event will start at 9am prompt on Saturday 15th November 2014, once again being held at the popular and centrally located Stirling University. Watch this space as more speakers come on board! You can keep up to date with all future SDC related announcements through our Facebook page. As usual we will have a fantastic raffle with great prizes - so don't miss out! We will also have our customary photography competition so please bring your above and below water shots which will be judged on the day. In addition, there will be plenty of trade stands with lots of dive kit for sale at excellent prices. Ticket prices remain the same as last year, at £20 in advance, and £25 on the door. This includes a welcome tea/coffee plus a hot lunch. Tickets are available to buy through the website here, and can be paid for via PayPal, or using a credit or debit card. After the conference we have a themed party organised in the University Hotel which is a great way to let your hair down, and why not stay overnight as we have good rates for the Hotel. Ticket costs are £15 which includes hot food. Tickets are also available to buy through the website here. To buy more than one ticket, select Add to Cart, then update the number required on the next web page. Please remember to include names of all those attending in the Order Comments box at the bottom of the checkout. Alternatively, you can send a cheque in to HQ along with the names of those attending. So folks come along and join in what promises to be a great conference again as it's organised for all! At Eastwood Sub Aqua Club this year we've decided that our annual summer solstice weekend will be held a bit closer to home, at Pilmuir Quarry in Newton Mearns, which is our own local training site. We'd like to invite members of other clubs along for an open-day on the 23rd June with a barbeque and some diving. For further information see our poster here. These awards are designed to reward an individual's exceptional contribution to our sport. This contribution could be effort that has encouraged new people to become divers, encouraged existing divers to complete further development training, the organisation of dive expeditions, or some other activity that has raised the profile of diving in a positive way. It may also be an Instructor who has encouraged and developed new divers and delivered training. If you know of any individual within ScotSAC who has made a significant contribution to the sport, in any way, now is your chance to nominate them for recognition. There will be 1 prize of a Suunto DX - the world's first watch-sized CCR dive computer, worth a whopping £995! Judging will be by a panel consisting of the Chairman, National Diving Officer and General Manager of Suunto Diving UK. All Nominees must hold current membership of the Scottish Sub Aqua Club and may not be current members of the Board or National Diving Council. The closing date for nominations is 1st November 2013 with the lucky winner being announced and prize presented at the ScotSAC Dive Conference in Stirling on 9th November. Download Nomination forms from here.